Every day, all day people flip on the lights, turn on their TVs, charge their cell phones and use electricity for various aspects of their daily lives. How does all of that activity translate into what they’re billed every month? And, what can member-consumers do to help keep the rates low? Many electric cooperatives have load managements programs to help reduce their monthly bill from their wholesale power supplier. Rushmore Electric, a Basin Electric Class A member, started its load management program in 2011, to help reduce its monthly bill from Basin Electric, the co-op that makes and transmits the power to Rushmore Electric. Rushmore’s program is a joint effort of all its member co-ops. In the program’s six years, Rushmore Electric has saved its members money. In 2016 alone, the co-op saved $1.684 million. 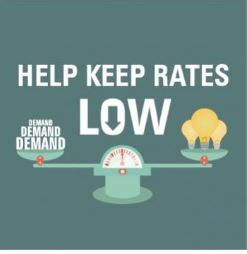 Learn more about how member co-ops and member-consumers can help keep rates low in the May-June 2017 issue of Basin Today: Power to keep the electric bill low. Watch to learn more about how a load management program works: How using electricity wisely can help out your neighbors.